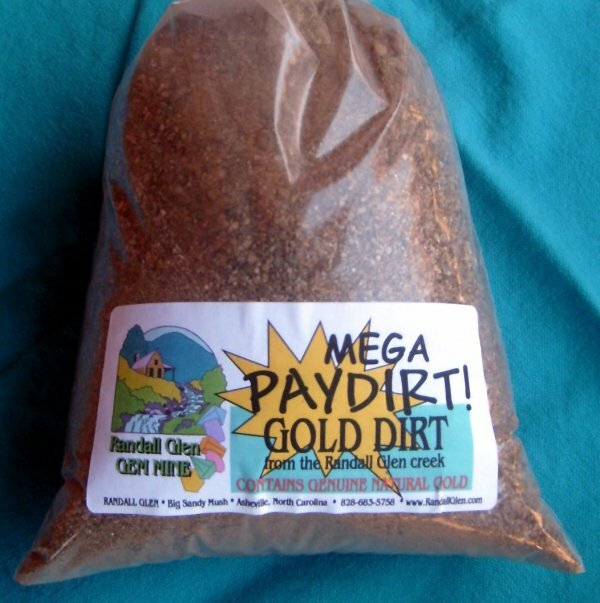 Over 2 ½ pounds of gold bearing sand and gravel hand dug from our Randall Glen creek. This great Pay Dirt will provide many days of mining, and we think you’ll be very happy with the gold you find. Includes instructions for mining at home and how to tell “if it’s the real thing”. This is all natural gold dirt, unsalted and unsearched. We classify our Paydirt down to ½ inch so you don’t have to fool with big rocks. This is unsearched dirt with quartz gravel, garnets, and kyanite, with very little black sand, and nice color. Keep an eye out for rubies and sapphires, too—this is corundum country! We dig your Paydirt directly out of our goldbearing creek, dry it so you get a good honest weight, and ship it out without any highgrading. Any gold in there is all yours, without anybody picking through it first. We recommend that you pan your Paydirt very slowly, a small amount at a time. Pan it over a catch basin so you don’t lose anything, then pan it again. This is 100% natural, unsalted Gold Paydirt—the real thing! The creek changes with every storm that comes down the mountain, so we can’t guarantee how much gold you’ll find, but we find gold in every sample pan. Call us at 828-683-5758 to order.